SriLankan Airlines is desperately looking to cancel the orders placed to acquire new aircraft, Chairman Ajith Dias said. “Taking delivery of them and then running them will further add to our losses,” he said.The Chairman said that the orders to acquire them were firmly placed by the previous government and its very difficult to cancel them. He said that leasing out one of their aircraft to Pakistan Airlines (which was operating on the Colombo-London route) has helped the airline’s bottomline. “We are looking at similar synergies with international airlines”. SriLankan Chairman Ajith Dias at the Global Contact Centre opening yesterday. One of the staff members.Pictures by Thurshara Fernando. Commenting on the divesting on the airline he said that ten international airlines have responded to the EOI and there are very ‘serious buyers’. “We should be able to ‘pick’ a partner or candidate by the end of the year and it will be done by the government. “As far as SriLankan is concerned, we provide reports and information to these 10 airlines”. Asked by Daily News Business on the losses of the airline he said that the losses are narrowing. “I must say that the losses have narrowed by 29% and operation costs have come down by 70%. The biggest problem we have is the heavy debt they are facing”. Commenting on the commissioning of the 24 hour SriLankan new global contact sector at Iceland building in Colombo 3 yesterday he said it will add more value to the airline. “This is being done with Malaysian based Scicom which has already done this with over 40 other airlines globally”. The contract with the controversial ‘HelloCorp’ which was doing this Contact Centre is expiring and they did not qualify for the new tender which was won by Scicom. “I am confident that our new Global Contact Centre, which would be the first point of contact for many of our passengers, will tremendously increase levels of convenience and go a long way towards delighting our customers.” The new centre will provide services for all SriLankan Airlines’ passenger operations. The airline’s main contact number 1979, reachable from any fixed line or mobile in Sri Lanka, remains the same. Located at the Iceland Business Centre Premises in Colombo 3, the centre is in compliance with international standards on Data Security and Contact Centre Operations. 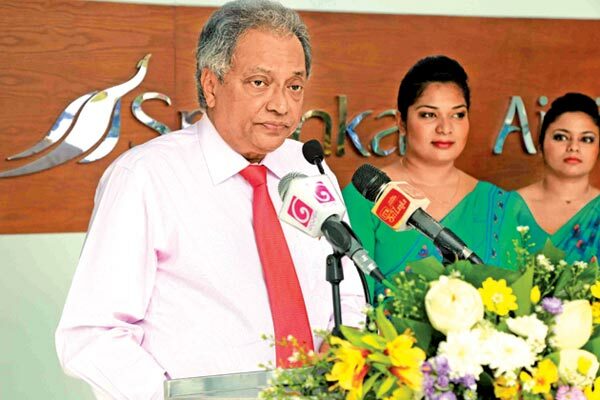 SriLankan Airlines and Mihin Lanka Chairman Ajith Dias once again confirmed that the loss-making budget carrier, Mihin Lanka will wind its operations by November. It will be merged with SriLankan. “We will utilise their routes and run them under the SriLankan banner as a full service airline,” he told Daily New Business. He said that they also plan to increase fares in some routes where the airline has an edge.“Mihin flights to Dhaka are very profitable,” he said.